As powerful as Microsoft Lync is, buyers should understand it is not a complete UC solution, and use of strategic partners is necessary. Voice and video are the most difficult services to provision correctly as workers require a high-quality, real-time experience. Anything short of that can remove many of the ROI benefits the company was hoping to realize. As such, companies deploying Lync should choose the best possible voice and video partner for Lync to simplify deployments and optimize user experience. 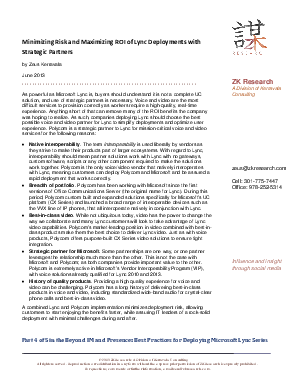 Read why Polycom is a top strategic partner for Microsoft Lync for mission-critical voice and video services.